Our mourning over the death of Saab has only deepened in recent months as we came to see photos of the aborted 9-3 Phoenix, the car that was intended to carry on the brand's hatchback legend in a uniquely Saab-ish way and bring them back from the brink. Unfortunately Saab went bankrupt before that car ever entered production. Now Jalopnik has learned that the 9-3 Phoenix may not be dead, straight from the man who designed it. 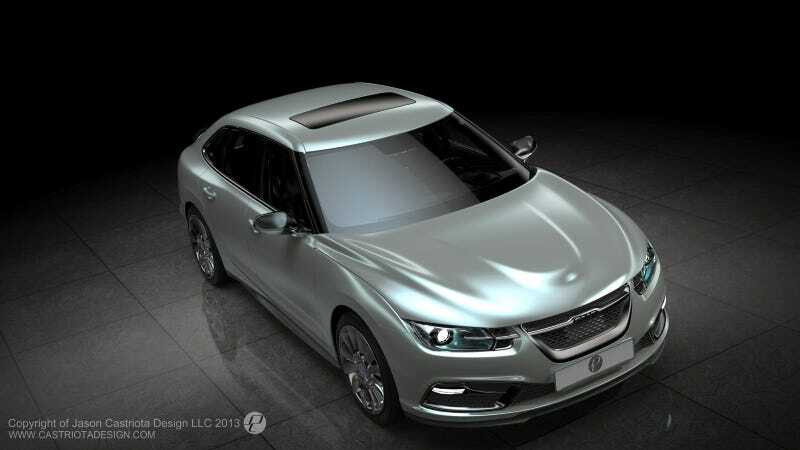 Last week we spoke with designer Jason Castriota at the New York Auto Show, and he shared some rather fascinating insights with us about the Saab that may yet rise from the ashes like the mythical bird it's named after — as well as these hi-res images of the final planned 9-3. Castriota, as you may recall, is the American designer who has penned or been taken part in cars like the Ferrari 599, the Maserati GranTurismo, the Bertone Mantide, the Ferrari P4/5 by Pininfarina and the Saab PhoeniX concept car. He was hired in 2010 to lead the design of the new 9-3, but the company closed its doors before the car could hit the streets. Here are the highlights of what he told us about the 9-3 Phoenix and the future of Saab. The 9-3 Phoenix design may come back under NEVS. That stands for National Electric Vehicle Sweden, the Chinese-owned company that bought what is left of Saab. NEVS is working on getting on their legs and becoming profitable, and once they do that, it is possible they could revisit the 9-3 Phoenix design and platform — and possibly as an electric car. "I can't say we've been in talks about this, but makes a hell of a lot of sense to build on what we made," Castriota said. "I wouldn't call it dead." The car wasn't designed to be electric but could be retooled for that. This 9-3 design was the final product ready to go to production. The engineering on the car was done, but the tooling to create it had not been built yet. Castriota described the car as being very close to ready when Saab declared bankruptcy in late 2011. "That's what it was going to look like," he said. All new 9-3s would have been all-wheel-drive hybrids. This has been reported elsewhere, but Castriota says the car for sure would have used a hybrid drivetrain. Specifically, it had a BMW four-cylinder turbo engine sending power to the front wheels, and electric motors mounted in the rear used offered torque vectoring to send power to the rear wheels. "The mules were really exciting to drive," he said. The team worked on the 9-3 until the day Victor Muller handed in the bankruptcy papers. The 9-3 was supposed to be Saab's savior, Castriota said. "We thought if we could launch this car we could make the company work. Unfortunately, the money was never there... I don't think they realized how big the odds were." The car had a unique size. Castriota said that size-wise, the 9-3 is somewhere between the BMW 3-series sedan and the 3-series wagon. Like the final 9-5, it was somewhat "bigger than expected," he said. "It was a very dramatic car. When you saw it on the street, you didn't mistake it for anything else." It's a hatch, but a sedan version was on the table too. Ex-Saab chair Victor Muller specifically wanted the car to be a hatchback, but a sedan version was also considered. But not for the U.S. — for China, a market that's even more adamantly pro-sedan than we are. They put an emphasis on its "Saab-ness." The car wasn't made to be a competitor to the 3-Series or anything else. It was made to be its own thing, Castriota said, and he feels they succeeded. "We said, 'Let's build the best Saab we can build.'" He feels Saab under General Motors gets a bad rap sometimes. "GM did a lot for Saab," Castriota said. They built them factories, gave them a dealer network, provided financing and gave them money for R&D, he said. He said it could be argued that some of the brand's uniqueness was watered down a bit under their new owner, but that Saab always remained innovative. He was mad about the Vampire Weekend video too. "I've been looking for a 900 SPG!" he laughed. What do you think of the 9-3 Phoenix? Would you like to see it rise from the ashes someday, even if it was as an electric car? Also, Jason will most likely be joining us for a Q&A session later this week, so think of what you want to ask him. Photos credit Jason Castriota Design. Used with permission.